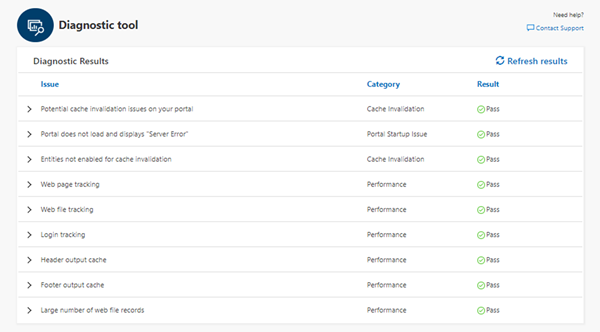 With recent upgrades to the Dynamics 365 Portal there are a few new options available on the Portal Configuration page. These options can be seen on the left side navigation in the screenshot below. To get to this configuration page you need to navigate to the Dynamics 365 Administration Center, click on the Applications tab and then select to configure your Dynamics 365 Portal. This blog will briefly cover the Diagnose and Resolve Problems feature. Once you select Diagnose and resolve problems you will be able to select the Run Diagnostics button. This will run diagnostics and produce the screenshot below. This process usually takes about a minute. The resulting diagnostics tool shows Potential Issues, their Categories and the Results (Pass, Error and Warning). Each issue is expandable, which you can see in the screenshot below. Because the issues in the screenshot all have a Result of Pass there isn’t much to see, but if there is a Warning or Error you will be given information on how to mitigate this, potentially including a button to action a change. Each Issue also has a rating, allowing you to give feedback on how useful the information was.